Gino, an Italian waiter at a restaurant I frequent in Miami, was a youngster in Napoli when Maradona played for the city’s soccer team. He says he attended every match. A few months ago, on the 30th anniversary of the Hand of God, Gino and I were talking about the great player. Nothing Maradona did could be immoral, Gino said. Besides, he continued after a few seconds of silence, being immoral against the English is not like stealing money from a nun. Gino makes a valid point. The English invaded Buenos Aires twice, in 1806 and 1807. They never apologized. We Argentines learn this at an early age. The English don’t even read about it in school. In 1832, the English seized Las Malvinas, which they called the Falkland Islands, and all the property of the Argentines who were living there. Then, in 1966, the Argentine captain Antonio Rattín was expelled in the first half in the quarterfinal against England at Wembley. Rattín had asked the German referee for a language interpreter. The referee, who did not speak Spanish, accused him of “violence of the tongue.” England won 1–0. Afterward, England manager Sir Alf Ramsey described the Argentines as animals — a headline that became seared into the collective memory of the Argentine people. It didn’t matter that many Englishmen thought the expulsion was improper or that, the following day, a cab driver in London apologized to Rattín and did not charge him for the ride. It happened 30 years ago, on June 22, 1986, at Estadio Azteca in Mexico City: Diego Armando Maradona scored a goal with his fist. Afterward, he claimed it had been scored by the hand of God. Apparently, shielding this fact from the referee was God’s way of compensating Diego for not endowing him with a better vertical leap. We know Diego’s explanation to be utter nonsense; God does not intervene in the game of soccer because it is too instructive as a laboratory of free will. Meanwhile, we humans demand that the game be played according to a moral code — impartial referees, no gambling — and to us it is obvious that it was the hand of a rascal that allowed Argentina to defeat England 2–1 in the quarterfinals. Obvious to everyone but Gino. And yet Gino — I have to admit that Gino has a point. These days, if a player were to try what Diego did, he would most likely be red-carded, suspended, and criticized in his homeland for behaving like an infant. 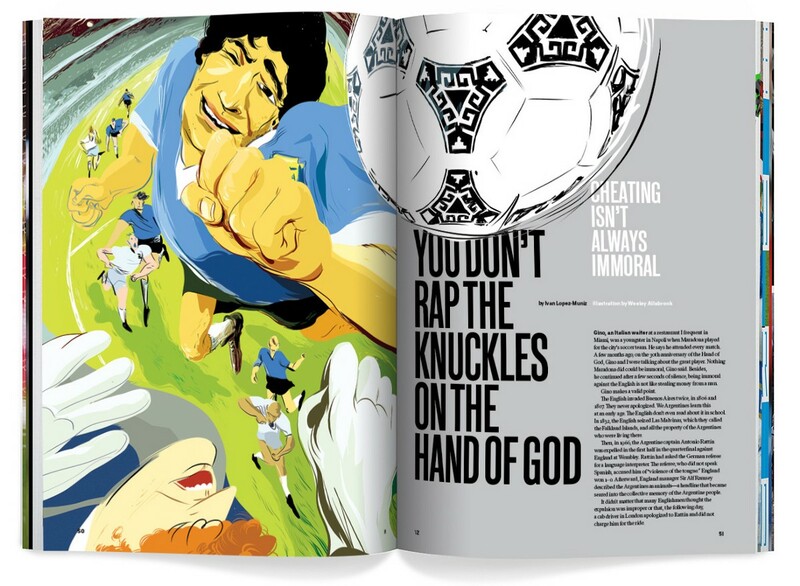 Maradona’s hand ball was the antithesis of fair play, the moral standard fans require to watch soccer. This is why we complain when referees make the wrong call or when cowardly players pretend to stumble and weep. Lionel Messi represents this bargain quite nicely. He runs about at top speed, like a cartoon. He doesn’t dive, and defenders generally don’t hack him down. This is progress; in the ’80s, he would have had it much rougher. 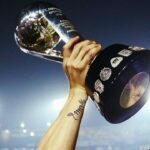 But people in Argentina continue to celebrate the Hand of God. The Asociación del Fútbol Argentino (AFA) includes the play in its promo reels. The Argentine government airs it on public TV. An entire nation praises the most blatant act of cheating ever caught on tape. 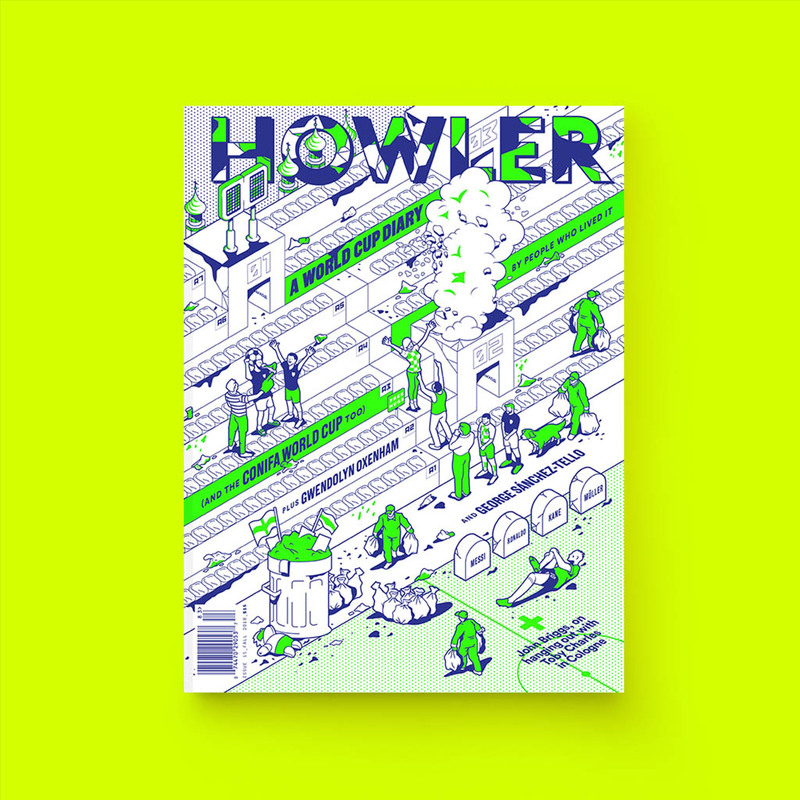 This story appears in the Spring 2017 issue of Howler. Subscribe with code STUDSUP to save 10 percent. Maradona’s act occurred against the originators of the game, the English, who gave us this wonderful sport. Shouldn’t we Argentines respect their creation? We ought to recall Corinthian FC, the amateur Oxbridge team of the 1900s that put fair play and moral values above anything so sordid as the desire to win. The Corinthians never argued with the referee or entered a competition in which the winner received a prize. If by chance the other team lost a man to injury, they immediately and voluntarily sent off one of their own, just to keep things even. 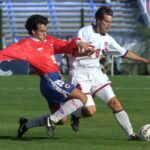 These attitudes no longer permeate the game — they never did — but they’re an early anchor on the fair-play side of the soccer spectrum. 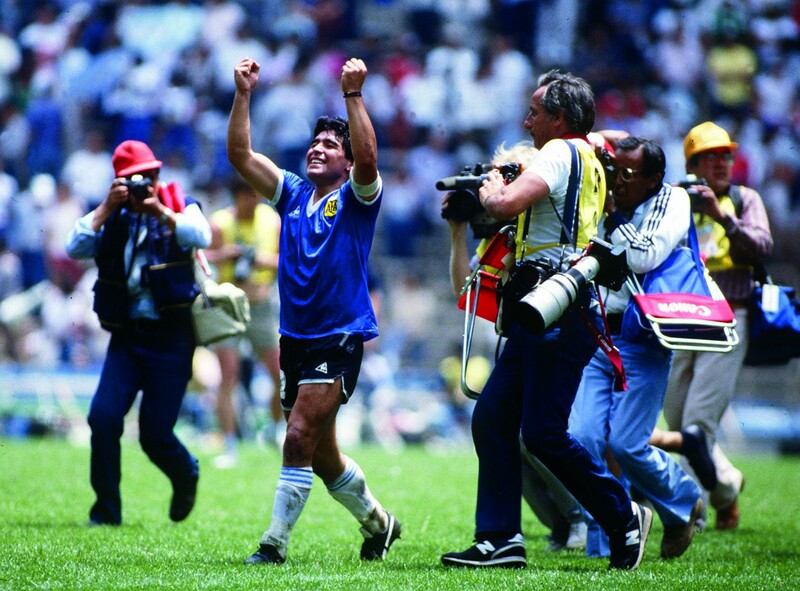 Remember this: Four minutes after the Hand of God, Maradona scored again. His first goal was dirty; this one truly was divine. Over the course of 11 seconds, he scored what most people consider the best goal of the 20th century. He was able to do it because of his brilliance, yes, but also because the English defenders tried to tackle him fairly and missed. Sure, the last bloke who slid into him did hurt his ankle a bit, but no Englishman decided to stop him with blunt force as Daniel Passarella would have done if it had been a regular match in Argentina in the late ’70s. The Englishmen respected Maradona’s creation, his beautiful art. But the Argentine people don’t seem to care. Why? Because Argentines are humans, and humans are hypocrites. But there is also all that history, the stuff I mentioned before, as well as our failed attempt to reclaim Las Malvinas in 1982. And because justice is sometimes circular. A conspiracy theory relating to 1966 still holds sway over a large swath of the Argentine public: that the German referee helped the English in the quarterfinal against Argentina while an English referee helped the Germans in the quarterfinal against Uruguay. It was a FIFA ploy. So the situation is this: Rattín, captain of Argentina and Boca Juniors, playing against England in the World Cup quarterfinals 50 years ago, expelled and humiliated. Maradona, captain of Argentina, formerly of Boca Juniors, playing against England in the World Cup quarterfinals 30 years ago, winning no matter what, a lo guapo. Revenge, sweet and just. Maradona, as the Scotsman Adam Smith would have explained as far back as 1752, was simply following his self-interest. Smith was a realist, a moral philosopher, and the father of modern economics (which is a fancy way of saying “the study of human behavior”). He knew that benevolence is the greatest virtue but that self-interest is what makes the world work. So Maradona wanted to win the World Cup. He wanted to deal a blow to the Englishmen who had taken out Rattín and snatched Las Malvinas with arrogance and pomposity, and he knew that his country wanted the same. It was in his and his nation’s self-interest. And that is what he did. And because of that, Argentina won a World Cup, and the world saw a great match that contained a great work of art that was immoral and a great work of art that was virtuous. Like so much of life, it’s a paradox. The English are prone to these as well. They gave us soccer, modern plumbing, Magna Carta, and orange marmalade, but they also caused atrocities and divvied up much of the earth to nobody’s satisfaction. Maradona’s performance in that quarterfinal match in 1986 was right and wrong, heroic and pathetic, honest and hypocritical. What does it all mean? Quite simply, it means that Maradona, on that day, was an Englishman.